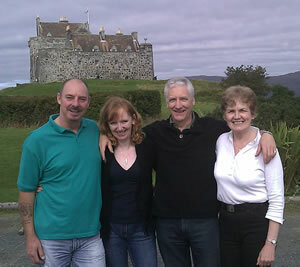 Four members of the Aberfeldy and District Gaelic Choir – Gilliain MacDonald, May Brown, Peter MacIntosh and Brian Owen – who make up the quartet Fuiameach, had a very successful weekend in Tobermory at the Mull Provincial Mod. The foursome won the Quartet competition for the fourth time in the past five years. May and Gilliain took first place in the Duet, singing their own composition, written in collaboration with Aberfeldy singer/songwriter Alan Brown. Gilliain went on to add to these successes by bringing home two more trophies for solo singing. The group will be part of the Aberfeldy and District Gaelic Choir when they perform in Perth Concert Hall on 27 November as part of the Choir Big Sing for the Perth 800 celebrations.